NEW BOOK FROM MOHR SIEBECK: DEVORAH DIMANT, From Enoch to Tobit. Collected Studies in Ancient Jewish Literature. 2017. XVI, 367 pages. Forschungen zum Alten Testament 114. 139,00 €, cloth, ISBN 978-3-16-154288-6. The studies by Devorah Dimant collected in this volume survey and analyze Jewish works composed in Hebrew, Aramaic or Greek during the Second Temple period, and discuss their contents, ideas and connections to the Dead Sea Scrolls. Together they offer a broad and fresh perspective of the Jewish literary scene at this period, developed in the land of Israel in the last centuries BCE and the first century CE. An earlier volume of Professor Dimant's collected studies was noted here a few years ago. And a recent essay by her on Tobit was noted here. This is the first full biography of James Rendel Harris (1852-1941), Bible and patristic scholar, manuscript collector, Quaker theologian, devotional writer, traveler, folklorist, and relief worker. Drawing on published and unpublished sources gathered in the States, Europe, and the Middle East, many of which were previously unknown, Alessandro Falcetta tells the story of Harris's life and works set against the background of the cultural and political life of contemporary Britain. Falcetta traces the development of Harris's career from Cambridge to Birmingham, the story of his seven journeys to the Middle East, and of his many campaigns, from religious freedom to conscientious objection. The book focuses upon Harris's innovative contributions in the field of textual and literary criticism, on the acquisitions of hundreds of manuscripts from the Middle East, on his discoveries of early Christian works, in particular the Odes of Solomon, on his Quakers beliefs and on his studies in the cult of twins. His enormous output and extensive correspondence reveal an indefatigable genius in close contact with the most famous scholars of his time, from Hort to Harnack, Nestle, the 'Sisters of Sinai', and Frazer. HT Facebook and Amy Anderson at the ETC Blog. LARRY HURTADO: The New Brill Greek-English Lexicon Test-driven. But for serious exegesis, you need also to take account of how a word is used in the larger Greco-Roman environment of the NT. This is especially so for infrequently used words in the NT. And for this now, I judge this Brill lexicon to be the superior choice. I’ve used it now a number of times over the past several months in specific searches, and have been pleased with the results. ..
Past posts on The Brill Dictionary of Ancient Greek are here and here. BRYN MAYR CLASSICAL REVIEW: Helmut Seng, Luciana Gabriela Soares Santoprete, Chiara O. Tommasi Moreschini (ed. ), Formen und Nebenformen des Platonismus in der Spätantike. Bibliotheca Chaldaica, 6. Heidelberg: Universitätsverlag Winter, 2016. Pp. 424. ISBN 9783825366964. €55.00. Reviewed by Diego De Brasi, Philipps-Universität Marburg (debrasi@staff.uni-marburg.de). It is impossible to assess critically every contribution within the limits of a review; hence, after a very brief overview of the book’s structure, I will focus on those papers which I consider most stimulating. DR. CYNTHIA EDENBURG: A King Who Reads Torah: What was Kingship Like in the ANE? (TheTorah.com). Deuteronomy envisions a king constantly reading torah and limiting his wealth and resources. Is this how kings are described in the rest of the Bible? JUDITH WEINGARTEN: Zenobia, Visionary Queen of Ancient Palmyra. In the 200s A.D. the Empress of the East turned her armies on Rome, and almost won. Thus begins the biography of Zenobia, queen of Palmyra, in the Historia Augusta (History of the Emperors), written near the end of the fourth century A.D. And what we read there is almost all we know about the queen. Sometimes, I think if it were not for her coins Queen Zenobia would be taken as a legendary figure. There could be a kernel of truth in the story, but it is a tale so fantastical, so gendered, with sources so unreliable, that it simply could not have historical value. Yet Zenobia did exist, and she did go to war against the Romans. And, as Empress of the East, she came within a hair’s breadth of victory. Judith wrote this post for the Getty Research Institute’s blog, The Iris, in connection with their Palmyra exhibition (on which more here and here). She has republished it on her own blog, Zenobia: Empress of the East. Past PaleoJudaica post on the Empress Zenobia are here and links. Alas, my hope that ISIS would spare Palmyra was unfounded. Cross-file under Palmyra Watch. Many other past posts on Palmyra, its history, the ancient Aramaic dialect spoken there (Palmyrene), and the city's tragic reversals of fortune, for now trending for the bette are here and here and links. NEW YORK (Reuters) - A disbarred U.S. lawyer convicted of impersonating Dead Sea Scrolls scholars in emails on Thursday lost his bid to escape his two-month prison sentence. The 2nd U.S. Circuit Court of Appeals in New York left in place Raphael Golb’s convictions in New York state court on 10 criminal counts, but rejected another seven. Golb’s lawyer, Ronald Kuby, said that he and his client had not yet decided on their next action. This case, which involved the Dead Sea Scrolls in a sad kind of way, has been going on quite a while. If you are unfamiliar with it or have forgotten the details, the article gives a summary toward the end. Also see here and here for summaries. For the other past PaleoJudaica posts on the subject, start here and follow the many links. NUMISMATICS: Pocket history: the secrets of ancient coins. The lulav and etrog often appeared on Jewish coins in classical times - but why? (Colin Shindler, The Jewish Chronicle). The root for “coin” in Hebrew, tevah, is the same as that of the “nature” of a human being. Just as God stamped an individuality on a person, so an ancient moneyer hammered a die on to a circle of silver. Coinage was also a form of propaganda for those in authority and conveyed often subtle messages to the population. Bar Kochba’s coins during his rebellion against the Romans contain the inscription, “Shimon, prince of Israel” — but only during the first year of his rebellion, 132-133 CE. During the following year, it is mysteriously shortened to simply “Shimon”. Was this a result of rabbinical protests against Bar Kochba’s pretensions to being the messiah? After all, some rabbis referred to him as Bar Koziba (“the liar”) rather than Bar Kochba (“the star”). That sounds speculative to me. The negative title "Bar Koziba" only appears much later in the Talmud. And we don't know how much influence the rabbis had in the time of Bar Kokhba. Aside from that, this looks like a convenient overview of ancient Jewish coins. But numismatics is not my field. It also seems not to be the field of the author. So I cannot vouch for all the specifics. The only one-volume edition to include all the published stories included in M. R. James's 1931 Collected Ghost Stories, plus three uncollected tales. Includes a lively introduction that explores James's conservative, donnish background and the character traits that contributed to the extraordinary power of his closely focused tales, whose terrifying narratives are discussed. The most accurate and comprehensive annotations to James's stories elucidate his antiquarian, classical, and literary references as well as providing interesting publishing history details. An Appendix reprints the prefaces and introductions to James's individual story collections together with three short articles by James about the ghost story, which present the fullest first-hand account of his approach to the genre. M. R. James was a scholar who flourished in the late nineteenth and early twentieth century. PaleoJudaica has mentioned him from time to time with reference to his still-valuable work on the New Testament Apocrypha and Old Testament Pseudepigrapha. See here and quite a few links. He also published entertaining ghost stories, many of which were informed by his scholarly work. I'm pleased to see that they are out in a new, annotated edition. At the OUP Blog, the editor, Darryl Jones, gives an excerpt from his comments in the new edition. THE INTERNATIONAL ORGANIZATION OF QUMRAN STUDIES now has an official website at the University of Göttingen. NUMISMATICS: THE COINAGE OF QUEEN BERENICE II (Tara Sewell-Lasater, Pocket Change Blog). Queen Berenice II is mentioned in the Bible in Daniel 11:5-6 as "the daughter of the king of the south." I explain the passage in detail here. She also figures in this post. CORRECTION (7 January 2019): The struck-out paragraph above is an error. I have mixed up two Berenices. The Berenice II of the Ptolemaic dynasty is the one whose coinage is the subject of the article above. She is not mentioned in the Bible. The other, Berenice Phernophorus was an (unnumbered) queen in the Seleucid dynasty. She is the Berenice who is mentioned in Daniel 11. Sorry for the confusion. BIBLIOGRAPHIA IRANICA: Administration in the Achaemenid Empire. Notice of a new book: Jacobs, Bruno, Wouter F. M. Henkelman & Matthew W. Stolper (eds.). 2017. Die Verwaltung im Achämenidenreich – Imperiale Muster und Strukturen. Administration in the Achaemenid Empire – Tracing the Imperial Signature. Akten des 6. Internationalen Kolloquiums zum Thema »Vorderasien im Spannungsfeld klassischer und altorientalischer Überlieferungen« aus Anlass der 80-Jahr-Feier der Entdeckung des Festungsarchivs von Persepolis,. Landgut Castelen bei Basel, 14.-17. Mai 20. (Classica et Orientalia 17). Wiesbaden: Harrassowitz Verlag. Follow the link for a description and ordering information. The Persepolis Fortification archive is important for the book. More on that here and many links. The Persepolis Fortification Archive Project Blog is here. Their annual report for 2015-16 was recently posted here. I'M OFF TO THE 2017 BRITISH NEW TESTAMENT CONFERENCE. It is being held at Saint Patrick's College Maynooth in Ireland. I am especially looking forward to our group visit to the Chester Beatty Library, on which more here and links. I will blog as often as I can, although posting may come later in the day than usual. But I have made sure that there will something for you every day while I am away. So please keep visiting PaleoJudaica as normally. 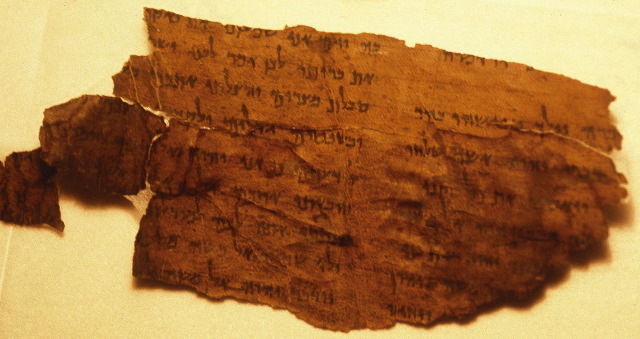 The Post-2002 Dead Sea Scrolls-like Fragments and Bible Study Software (Årstein Justnes). The Post-2002 Dead Sea Scrolls Fragments: A Tentative Timeline of Acquisitions (Årstein Justnes & Ludvik A. Kjeldsberg). We have constructed a tentative timeline of acquisitions using Knightlab Timeline JS. Comments and corrections are appreciated. The Post-2002 DSS-like Fragments: A Price List (Årstein Justnes). DAVID M. WEINBERG: Fund the sifting project (Israel HaYom). One of the most important archaeological projects in Israel today, the Temple Mount Sifting Project, has run out of money and been temporarily shut down. Prime Minister Benjamin Netanyahu and his government should move quickly to fund the project until completion. Somebody needs to fund it. The Israeli Government would find the money well spent. But I wouldn't say no to funding from a wealthy philanthropist either. For past PaleoJudaica posts on the Temple Mount Sifting Project, start here and follow the many, many links. For more on the current funding crisis, see here and here. My first post on the project was in 2005, shortly after it began. The project's blog is here. For more background on it, see the About page. THE FACES AND VOICES BLOG: The eBay experience. Dr. Roberta Mazza thinks that eBay could do better in its dealings with antiquities and antiquities dealers. The reality is that everything seems allowed because too many collectors/dealers, as the two who purchased the papyri at the centre of this post, do not respect the laws and ethics underpinning such exchanges (before you even start with a pointless counter-argument, I am afraid to say that no, darling, eventual ignorance of the laws does not excuse them). Moreover, eBay policies enforcement seems inefficient at best, and police active control is also low, even more so in the UK where the Art and Antiques Unit seems to be under threat of closure. Despite all the rhetoric on heritage preservation, and the amount of public money put in various programs, the truth is that this kind of everyday unregulated and unethical (when not illegal) market is slowly killing our cultural heritage in the open and apparently with the consent of everyone implied in the transactions. THIS IS MY FOURTH AND CONCLUDING POST commenting on Samuel Zinnner's comprehensive report on the Jordanian Lead Codices: Son of the Star: Bar Kokhba and the Jordanian lead books, which has been published online by the Centre for the Study of the Jordanian Lead Books. You can find the first post, which deals with the materials tests on the codices, here. The second post, on the inscriptions on the codices, is here. The third post, on the quotation of the Abgar-Selaman epitaph in the codices, is here. For earlier posts on the codices, start here and follow the many, many links. I cannot prove that the Jordanian metal codices are not ancient artifacts. One cannot prove a negative. But I do not find this possibility credible. Here are my reasons. There are many anomalies in the metal codices that cry out for explanation. They have an odd mixture of scripts from different periods. They make extensive use of coin inscriptions and motifs from a period of several centuries. The text on the codices consists mostly of words and letters associated with the coins, often disassembled, reordered, rearranged, or encoded. Otherwise they mostly look like gibberish. As far as I can tell, the Hebrew on the codices uses only the paleo-Hebrew script of the coins, although we know from the discovery in the twentieth century of many Hebrew manuscripts from the Bar Kokhba period that the revolutionaries also used the square Hebrew script much of the time. The codices mention two Roman emperors and the mother of one of them, and these people lived around 200 CE, long after the Bar Kokhba revolt. Again, the source for them was at least partly coins. An effort to make sense of the text of the codices requires appeal to a huge range of traditions from ancient Mesopotamian iconography to Renaissance magic. And there is the problem of the inexplicable use and unlikely survival of the Abgar-Selaman inscription, which I have covered in detail in the third post in this series. Dr. Zinner has offered individual explanations for most of these anomalies. He has put a huge amount of work into his treatment of them. I find some of his explanations plausible and others less so. But one explanation covers all the anomalies at once: the codices are clumsy modern productions. To put it another way, isn’t it lucky that these ancient artifacts make such extensive – virtually exclusive – use of epigraphic materials that happened to survive to modernity? It happens that the creators of the codices, both in the Bar Kokhba era and a couple of generations later, had a fascination — to the point of obsession — with coin inscriptions and coin iconography. And isn’t it lucky that the one other inscription they used (incomprehensibly to us) happened to be a grave epitaph that just barely survived, battered but still readable, to our time? Again, we have been here before, haven’t we? Here I invoke my “lottery rule.” If we have to have won the lottery for an unprovenanced object to be a genuine ancient artifact, it probably isn’t. I cannot rule out the possibility that the “core group” of metal codices are medieval productions. Dr. Zinner leaves this as a live possibility too. The main problem with this idea is the Abgar-Selaman inscription. Did someone in the High Middle Ages dig it up, quote it on the codices, then bury it again until it was found in modern times and put in a museum? That doesn’t sound very likely to me. It still sounds like winning the lottery, although granted the pot is not as big. But if a medievalist wishes to make a case that they belong in this period and placing them there solves at least most of the problems, I am prepared to listen. The closer we come to the present, the less luck is involved in the survival of the Abgar-Selaman inscription. Could the codices be early modern productions, say of the sixteenth to eighteenth centuries? Antiquarianism was certainly alive and well in this period. And a cache of lead books with cryptic Latin and Arabic inscriptions was excavated in Granada, Spain, in the late sixteenth century. They too were ostensibly set early in the Common Era. They were in fact fakes — recent productions. So such ideas were in the air. The materials tests on the codices seem firmly to exclude a date of creation in the twentieth century, and apparently in the nineteenth as well. That said, I cannot entirely exclude the possibility that a very clever modern fabricator has fooled the scientists. It has happened before. Let me close with some final observations. First, I realize that I concluded some years ago that the codices were not ancient artifacts. I think my reasoning has stood up pretty well and I still think the same. The evidence I have discussed in these four posts seems convincing to me. But I acknowledge that to someone starting from a different place, it could all look like a great big heap of confirmation bias - one that I cannot see through my own cognitive dissonance. So, please, do not take my word for it. I have tried to present my views with the evidence and reasoning laid out transparently. But if this subject interests you, take the time to go through Dr. Zinner’s massive, comprehensive report and make up your own mind. In the end, what I think doesn’t matter much. Whatever scholarly conversation there is about the codices in the coming years does. Second, that conversation has yet to begin. Let us remember that no peer-reviewed research on the codices has been published. Neither for the materials tests nor for the textual and iconographic content. This is not to deny Dr. Zinner's contribution in this report, which gives us a lot of new information and a carefully thought-out and presented discussion of it by someone who has spent years working with the material. But it has not passed a formal peer-review process in which the ideas presented have been critically weighed by other specialists who had veto power but who nevertheless gave the all-clear for publication. That is an important step that should not be neglected. The people at the Lead Book Centre are working on this. If and when that formal conversation begins in the journals, maybe we will make some more progress. Third, I should underline the fact that Dr. Zinner does not present a dogmatic position on what the codices are and when they were made. He puts a lot of effort into making the best case he can that they could be ancient, but he keeps other possibilities in mind throughout. He realizes that some of them must be modern fakes. He allows that some or all of the "core group" may be medieval, or even that all of them may be early modern or even recently modern ritual objects or fakes. I appreciate his openness. As I have said, I do not find the idea that some of them are ancient to be a credible possibility. But otherwise, our views are not too incompatible. Fourth, a question for anyone who thinks the codices could be ancient artifacts. Can you point to anything in them that we did not know, say, a century or more ago but that we know now thanks to discoveries in the last century (the Judean Desert scrolls etc.)? If a pattern of such things could be shown, that would be a significant argument in favor of their being ancient. If not, it is one more reason to doubt it. Fifth, I have no idea why the codices were made. If they are fakes, they were faked in a particular context, made to fool particular people. This is a question for specialists other than I, but it remains a question. I would not rule out the possibility that they were made for some artistic or ritual purpose that involved no intent to deceive. I think the case for an apotropaic use is weak, but according to the claims of the metal analysis they were used for something for a period of time. Sixth, what is the history of the Abgar-Selaman inscription from Madaba? When was it discovered? Where has it been held or displayed and when? Are there earlier references to it? Where exactly was it located originally in situ? Follow the history of the Abgar inscription and it may lead you to the people who made the codices. I didn't plan for seven final concluding observations, but that's how it came out. Seventh and last, I would like to thank the members of the Lead Book Centre for their work on the codices. And I would especially like to thank Dr. Zinner for producing this comprehensive report. He did it for free on his own time and it is clearly a labor of love. Whatever the eventual outcome of the discussion, what he has done is important and is much appreciated. Cross-file under Fake Metal Codices Watch. I acknowledge that various elements of the current discussion may point to some of the codices being something other than fake, although nothing I have seen adds up to a persuasive case. In particular, I have reviewed the evidence carefully and I am unconvinced that they are ancient artifacts. In any case, I continue to include this cross-file rubric so that readers can search it to find all my posts on the subject. OOPS! Fake History: Netanyahu Boasts About 'Ancient Jerusalem Coin' - Turns Out to Be Kids' Souvenir. Netanyahu uploaded (then deleted) to Facebook a photo of the object, describing how its discovery attested to long-time Jewish ties to the Holy Land (Nir Hasson, Haaretz). Meanwhile, however, Netanyahu had joined the trend, uploading a photo of the item on his Facebook page and writing how the coin, ostensibly a half-shekel dating to the era of the Second Temple, had been found in the province of Benjamin, in the West Bank. The moving discovery, the premier wrote in his post, further attests to the deep ties between the people of Israel and their land – including ties to Jerusalem, the Temple and Judea and Samaria. Netanyahu’s Facebook editor, Yonatan Orich, says the post has been removed until the issue can be clarified. I don't blame the Prime Minister for being fooled by the story. I and a lot of other people were too. But there is perhaps a lesson here. It is best not to try to score political points off of new discoveries before they have been fully authenticated. Were Ophir and Tarshish in India? PHILOLOGOS: Did King Solomon Trade with India? On the possible whereabouts of Ophir and Tarshish, and how to get there by ship from Palestine (Mosaic Magazine). We seem to be trapped, indeed, in a form of circular reasoning. On the one hand, a number of biblical words are said to have originated in India because Solomon’s sailors reached it or the route to it. On the other hand, Solomon’s sailors are said to have reached India or the route to it because a number of Indian words occur in the Bible! Is there a way out of this loop? If there is, it is connected to the “once in three years” (aḥat l’shalosh shanim) of 1Kings 10:22. Although nothing I’ve read on the subject treats of this phrase (it’s quite possible that I’m ignorant of scholarship that does), it seems reasonable to assume that it refers to a period of time in which Solomon’s ships regularly departed from Etsyon-Gever and returned to it. Where could they have been in this period? Some entertaining but speculative ideas here. A couple of past posts on Ophir are here and here. Philologos last discussed the name Tarshish when it came in as runner-up for the new Hebrew name of the planet Neptune. ANCIENT JEW REVIEW: Book Note | Religious Deviance in the Roman World (Catherine Bonesho). Jörg Rüpke. Religious Deviance in the Roman World: Superstition or Individuality? (Translated by David M.B. Richardson). Cambridge University Press, 2016. Scholars of ancient religion and legal traditions will find Rüpke’s volume resourceful for the development of religious norms throughout Roman history, from the early Republic to Late Antiquity. Though expansion and clarification is needed in various sections, especially regarding what constitutes religion, the usefulness of Rüpke’s volume truly is found in the presence of primary sources as well as the contextualization of those sources in the Roman world. I'm surprised not to see any mention of magic, which was often regarded as borderline religious deviance in antiquity and sometimes over the line. OOPS! Too good to be true: 8-year-old’s ‘rare coin’ not an ancient artifact. Originally thought to have been minted during the 66-70 CE Jewish Revolt, the piece is actually a worthless, kid-made souvenir from the Israel Museum’s Youth Wing (Amanda Borschel-Dan, Times of Israel). For more than 20 years, children visiting the Israel Museum in Jerusalem during the winter festival of Hanukkah have had the opportunity to go home with an “ancient” coin. Struck by the kids on a small mint in the museum’s Youth Wing, the souvenir is an exact, albeit one-faced, replica of an ancient coin. Perhaps too exact, it turns out. Reproduction technology is now very good. Museums can produce children's toys, made by the children, which can be mistaken initially for genuine ancient artifacts. Apparently this one even fooled experts. I suspect that forgery technology is also this good, and probably considerably better. Just saying. This also reminds me a little of that story involving the plastic toy dinosaur at an archaeological dig. I noted the original story of Miss Halevy's coin discovery here last week. Cross-file under Numismatics (Not). Did the Ark of the Covenant house pagan gods? ARCHAEOLOGISTS SPOIL EVERYTHING: The Real Ark of the Covenant May Have Housed Pagan Gods. The holy ark was likely kept in Jerusalem for much less time than the Bible tells us. And it may have contained something other than the Ten Commandments (Ariel David, Haaretz). The last time the Ark of the Covenant was supposedly seen was in Jerusalem, some 2,600 years ago. Now archaeologists are exploring the ancient town of Kiriath Jearim, where the Bible says the ark was kept for 20 years before being taken to Jerusalem. Even if the excavators don’t expect to find the ark itself, and they don't, they have made discoveries that shed new light on the history of the ancient Israelites and the birth of Judaism itself. Their finds also support theories that King David may not have been the one who moved the ark to Jerusalem. Seriously, there is some very interesting work going on at Kiriath Jearim. But any connection between it and the real Ark of the Covenant (assuming there was such a thing) relies on a great deal of inference and imagination. Still, inference and imagination are most of what we have for the Ark, so we may as well put then to good use. For many past PaleoJudaica posts involving the Ark of the Covenant, both "real" and imagined, start here and here and just keep following the links. ICONOGRAPHY: The current issue of Greek, Roman and Byzantine Studies (57.3, 2017) has an article by Roy D. Kotansky on the gemstone that bears what is reportedly the earliest image of Jesus' crucifixion (c. 200 CE). The obverse, showing the earliest extant image of the Crucifixion, has an inscription suggesting a non-canonical source, while the reverse inscription reveals later reuse of the gem by a non-Christian. I noted another article about the gem here. In that post I raised some queries about its provenance and authentication. Dr. Kotansky addresses these questions, citing my blog post. See especially p. 632 and n. 4 of his article. Another interesting point about this object is that the the back side seems to have been inscribed (later?) by a different hand and a different engraver. BRYN MAYR CLASSICAL REVIEW: Eric H. Cline, Three Stones Make a Wall: The Story of Archaeology (with illustrations by Glynnis Fawkes). Princeton, Oxford: Princeton University Press, 2017. Pp. xix, 455. ISBN 9780691166407. $35.00 (hb). Reviewed by David Gill, University of Suffolk (david.gill@uos.ac.uk). Cline writes with a passion to communicate his love of archaeology to future generations (“a new introductory volume, meant for people of all ages”, p. xvii). His title is taken from the discernment of archaeological features (p. 217); he continues, “Six stones is a palace built by aliens”. His closing paragraph reflects on how he would rather be digging and demonstrates Cline’s commitment to the careful scientific study of the past. At times this (British) reviewer found the book idiosyncratic (as Cline accepts, p. xix, and suggests critics write their own version), the style relaxed, and the choice of locations were sometimes unexpected. For all that, I am glad to have read it, and to have absorbed a little bit of Cline’s enthusiasm for our shared discipline: and I look forward to Cline’s students, who have shared this journey, becoming the next generation of archaeologists. I didn't know about the Disney Chair of Archaeology at the University of Chicago. Stökl, "Can There Be Another Prophet Like Moses?" DR. JONATHAN STÖKL: Can There Be Another Prophet Like Moses? (TheTorah.com). Deuteronomy introduces the possibility of future Moses-like prophets who will continue to instruct the Israelites how to follow YHWH’s commandments. At the same time, it makes the existence of such a prophet virtually impossible. MICHAEL SATLOW: The Meaning of “Torah”: A Report from the Enoch Seminar. He brings us some stimulating and sometimes surprising conclusions from the conference. ARCHAEOLOGICAL INSTITUTE OF AMERICA: Digital Unwrapping: Homer, Herculaneum, and the Scroll from En-Gedi. Professor Brent Seales will describe his ground-breaking research that is allowing modern scholars to access carbonized ancient texts that have been unreadable up to now. Professor Seales earned his PhD in computer science at the University of Wisconsin and is currently chair of the computer science department at the University of Kentucky. The lecture takes place at the University of Wisconsin on 20 October 2017. Follow the link for more details. For more on the work of Brent Seales, start here and follow the links. Cross-file under Technology Watch. ZOHAR WATCH: Restoring Kabbalah to Mainstream Judaism. A new translation has made the Zohar—Jewish mysticism’s key work—accessible at last. Is that a good thing? (ARTHUR GREEN, The Atlantic). Matt has made the Zohar into a readable work—for the first time in any language. Israeli scholars, writing in Hebrew, are consulting his notes. Students in college or seminary courses, lacking the linguistic tools to delve into the original, will now be able to prepare assignments on this previously closed text. Matt, along with a distinguished coterie of scholars associated with this project, is making the bet that the true radiance of the work will be enhanced rather than diminished by this translation. For much more on the Zohar and on Daniel Matt's translation of it, start here and follow the many links.